Marion Cotillard & Michael Fassbender in a short dramatic clip from Macbeth. 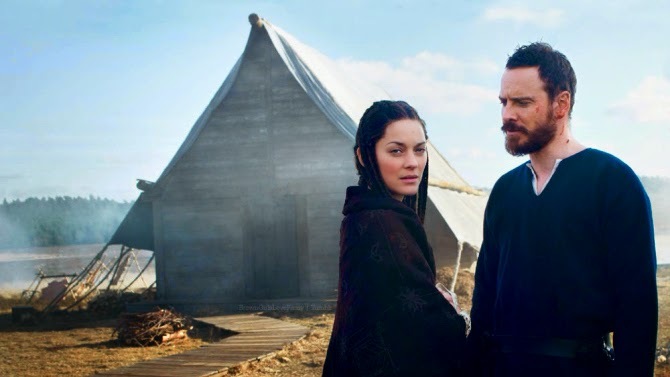 This past Monday we took a look at some fresh new images from Macbeth, making its' debut at Cannes tomorrow. The big question is how will Marion Cotillard, luminous, lovely, very French Marion Cotillard, pull off the lack of Scots accent as Lady Macbeth. Michael Fassbender, I have no doubt will rock the pants off Macbeth. There have been well over a dozen versions of Macbeth—I think this is number 17— including an animated production in 1992, a collaboration between the BBC and Russia. And that doesn't count all the reimaginings of Shakespeare's Scottish play, like Kurasawa's Throne of Blood! For today, just a hint of what's to come in the latest film production — via this 24 second snippet I found at Rope of Silicon.